The pope lamented the “absence of various Governments at the recent United Nations Conference in Marrakesh,” referring to nations such as Israel, Italy, Hungary, the United States, Australia, Switzerland, and Poland that chose to sit the meeting out. Pope Francis called on the leaders of nations Monday to lend assistance to migrants and refugees who have left their homelands for any reason and to help them integrate into their new homes. Migrants and refuges are “among the weak of our time that the international community is called to defend,” the pope said in his annual address to the diplomatic corps accredited by the Holy See. NincomPope Frances is a minion of Satan. He is the enemy of freedom, liberty and civilisation. Pretentious, asinine, word-salad nonsense. What is he trying to say here? Incomprehensible. What is fair about an unelected bureaucracy imposing rule on us anti-democratically? This pope is a dangerous lunatic. “The indispensable premise of the success of multilateral diplomacy is the good will and good faith of the interlocutors, the willingness to a fair and sincere confrontation and the willingness to accept the inevitable compromises that arise from the confrontation between the parties,” he said. The pope went on to put forward his belief that globalist organizations are key to the maintenance of peace and international stability. These tendencies “undermine the vocation of international organizations to be a space for dialogue and meeting for all countries,” he said. It is also partly due to an attempt on the part of multinational organizations to “impose their visions and ideas, triggering new forms of ideological colonization, not infrequently disrespectful of the identity, dignity, and sensitivity of peoples,” he said. This rise in nationalism is in cases the result of a “heightened malaise” that is experienced by the citizens of many countries, who perceive the dynamics that govern the international community as “ultimately far from their actual needs,” he said. Curiously, nowhere in his 5,600-word speech did the pope mention “subsidiarity,” the central principle of Catholic social thought that protects the freedom of individuals, families, and communities from the interference of state and international bodies. As a result, Catholics believe that international bodies should never be all-encompassing or invasive regarding the internal life of nations but should limited their activity to areas of life that cannot practically and effectively be governed by the nations themselves. The sovereignty of nations should never be compromised by overly aggressive international legal or political structures. Importantly, according to Catholic thought, subsidiarity is a fundamental component of the common good and not a counterbalance to it, and where it is disrespected, the common good suffers. Although subsidiarity is fundamentally a limiting principle on the interference of a society of a higher order in the life of a society of a lower order, it furthers the common good by defending essential freedoms and the autonomy of societies of a lower order, including that of individual nations. The Pope remains safely “walled up” at the Vatican surrounded by guards while he appeals to Europe to fling open their doors to illegal migrants. POPE Francis has used Epiphany 2019 to launch a “heartfelt appeal” to European leaders following an escalating migrant dispute – here is what you need to know. Epiphany is the religious feast day celebrated by millions of Christians around the world on January 6. As is usual on the holy day, Pope Francis gave a mass to 60,000 people in St Peter’s Basilica, Rome. But the Catholic leader also used his platform to wade into an international diplomatic row about migrants trying to enter European waters. The dispute between Catholic nations Italy and Malta centres around 49 migrants rescued by German humanitarian group Sea-Watch 3. The passengers were plucked from two unsafe vessels travelling out of Libya on December 22 and December 29. Both Italy and Malta have refused entry to both groups, one of which includes three small children and four children. Now, Pope Francis has intervened, making his views heard on one of the biggest religious festivals of the year. 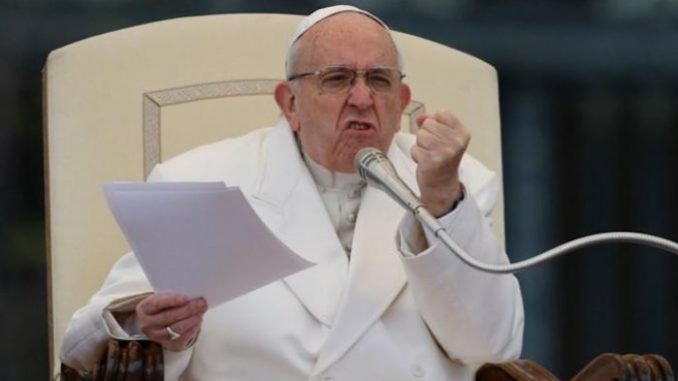 The Pope added the migrants concerned were only “seeking a safe port where they can disembark”…..
One theory is that God deliberately chose the utterly corrupt Francis as he would expose the utterly corrupt Catholic hierarchy to his flock. 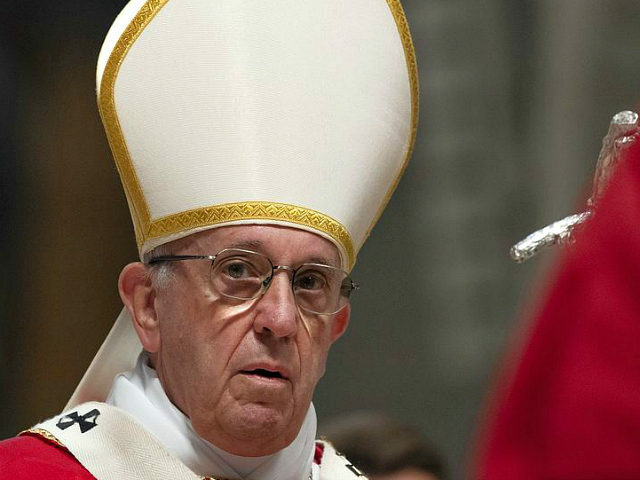 Is there not one cardinal willing to stand up to Frances and say the emperor has no clothes? Not a one. Just look at all these cardinals and bishops, not a one has the balls to say you are wrong and a threat to the church. Not a one. God should send him to hell asap. This from a man that sits behind the safe walls of an independent state. Socialist hypocrisy at its finest.